Mini Tourmaline is a compact straightener with very narrow plates (1.5 cm). This is the ideal styler for quick touch ups or if you need to use it just on specific areas, such as the fringe. 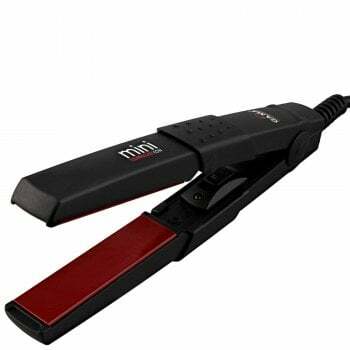 This mini straightener is particularly suitable for people with short hair as it can straighten shorter lengths with ease. It is an excellent travel companion with its 15cm length and 100g weight, you won't even notice it in your suitcase! If you travel with just hand baggage, this is the compact hair iron for you. It also has universal voltage, 110-240V and therefore it can be used all over the world without any problem! Mini Tourmaline's operation is so simple: Just switch it on and in a few seconds the plates will reach a constant temperature of 200°C. It comes with soft touch casing and therefore, is particularly comfy to use. The tourmaline-covered plates will glide easily over your hair, to leave it full of polished shine.